False moustache is an integral part of the volumetric make-up, which is used in various theatrical productions and kinorabotah and professional activities of detectives, bodyguards and all those who would like to be anonymous. In addition, the whiskers are a cosmetic item that hides imperfections, scars, etc. mustache can drastically change the appearance of the person, but can simply to emphasize and strengthen the striking appearance. That's why, from time to time, fashion mustache back. And a false mustache can help men be at its peak. You know that moustache is made by way of tamburelli. This requires a special wig making crochet hooks, thin tulle, card - special flat brush for the hair, and the hair. Disassemble the tufts of hair on length, comb on the card. Secure the card using strubles on the table. Lay combed the hair on the card, cover them with another card or brush to avoid flying. Lay the tulle on the stand, determine the shape of the product. Take the wig making the hook in your right hand beard up. Hold it like a pencil. Pull out the card a little bunch of hairs, fold them in half, forming a loop, hold it with your fingers of the left hand. Thread the hook into the loop of the tulle, and then in the hair loop, grab it and thread through the tulle. Without removing the hook from the loop, hook a few hairs. Holding the loop with your fingers, drag the ends of the hairs through the loop. Firmly tighten it. Fabrication of whiskers with tamburelli - a painstaking and lengthy process. However, whiskers are natural, are glued to the skin with special glue and indistinguishable from the real thing. 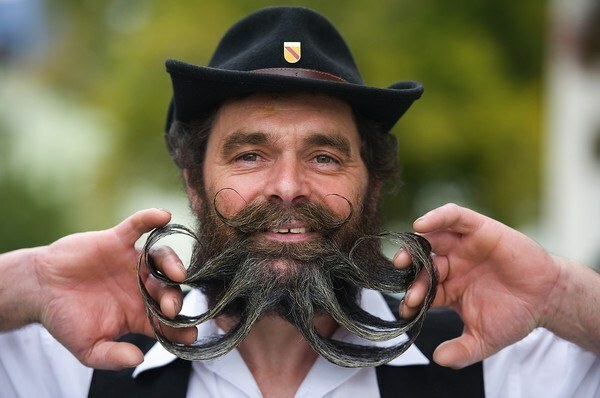 Moustache is made of synthetic and natural hair. It is quite clear that the makeup of actors allow the use of artificial fake mustache, so the action is on the stage, far enough away from the prying eyes. But the constant wearing a fake mustache in life requires more natural because crude forgery is immediately noticeable and causes unnecessary problems. Manufacturer fake mustache doing the wig-makers. They made wigs, sideburns, mustache and beard of natural hair.